At Seraphin, like Baracoda Group, we believe that small changes in behavior can have a big impact on health. We also believe that sleep is the most fundamental way to impact your health and rejuvenate the body. However, the use of screens is becoming increasingly prevalent in our society, especially by young people, at the expense of your sleep. Our platform is designed to tackle down your digital addiction during the night. 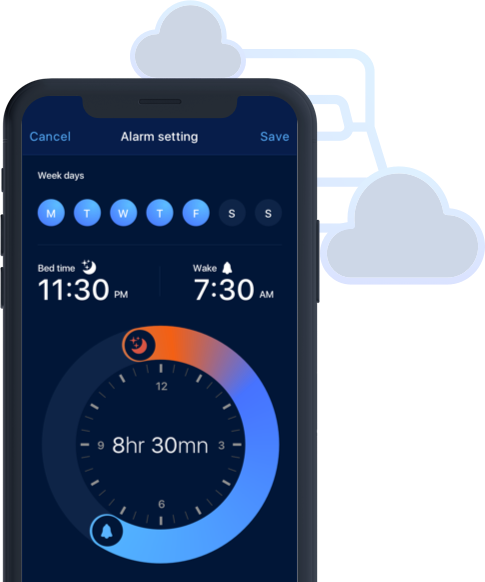 We deliver a complete sleep routine to improve your sleep quality by integrating analysis, recommendations, coaching, and multiple devices and applications into a complete sleep routine. Our mission is to help you detach from your screens with the power of IoT in a way that empowers users to get the most health benefit from their sleep. Founded in 2018, Seraphin is the first open platform designed to deliver a digital detox - helping you change your habits to combat digital disruption. And we are starting with nighttime. Seraphin is a sleep guardian angel that gives you a digital curfew - removing digital temptation, helping you relax and monitoring your sleep for better recovery from your day. Seraphin is a sleep science-based book and application designed to deliver a personalized sleep routine. The 1st to turn your mobile phone into a smart light bulb for a bedside lamp (Patent Pending). Also delivers a relaxation and waking light routine and a phone charger. Alerting user to their digital curfew through a sleep timer and providing digital detox daily report. Integrating sleep duration, cycle and heart rate into a personalized report. Offers a catalog of ambient sounds, podcasts, radio stations, music, and literature to help relax and wake refreshed. Founded in 2012, Radioline is a global radio provider – #1 in Europe – with +70,000 stations & podcasts, distributed by a large range of partners. Built on a highly scalable platform with enriched content management and massive channel aggregation, the service guarantees its million users universal access via any mobile device, online PC, connected TVs, IoT and in-car digital solutions. Founded in 2015, ISommeil is scientific sleep algorithm that helps monitor and measure the changes in sleep over time. It is validated by a medical protocol tested in a sleep center in Paris. It is a guarantee for you to always have reliable and quality information. Seraphin is always looking for talented people, do not hesitate to apply!